Here’s the twist. I’ve never read Three Cups of Tea, the 2007 mega-bestseller coauthored by David Relin Oliver and Greg Mortenson. I saw it for years in various airport bookstores; I even picked it up once or twice and glanced at the book jacket. I never felt the urge to read the book despite the glowing praise it had received, because something about the whole premise rang false. I’ve never trusted people who feel the need to strike million dollar book deals before imparting the “wisdom” they’ve supposedly learned while traveling. Similar to the odious Eat Pray Love, I assumed Three Cups would be full of self-aggrandizing humble-bragging, complete with pithy statements about how “the children of Afghanistan taught me more than I ever taught them”. I tend to be a bit cynical. So when I stumbled across short e-book entitled Three Cups of Deceit, I was immediately intrigued. Written by Jon Krakauer, an author who is quickly becoming of my favorite nonfiction writers. And when the subtitle read How Greg Mortenson, Humanitarian Hero, Lost His Way, I felt the sweet, sweet confirmation bias wash over me. Three Cups of Deceit is a seventy-page arrow aimed directly at the heart of Greg Mortenson, coauthor of Three Cups of Tea and founder of the Central Asia Institute, a charity that ostensibly exists to build schools in remote areas of Pakistan and Afghanistan. By educating the children of these war-stricken regions, Mortenson claims, they are less likely to become radicalized by Islamic extremist groups. Unfortunately, Krakauer claims, Mortenson has fabricated nearly every aspect of the narrative that surrounds his personality and his supposed charitable works. The “origin” story in Three Cups of Tea, in which Mortenson stumbles upon a remote village in the mountains of Pakistan never happened, or at least not in the village Mortenson claims. Mortenson’s eight-day kidnapping and abduction by terrorist groups was a complete lie. Many of the schools built by CAI have been abandoned due to lack of materials, funds, and teachers. Many more of the schools were simply never built at all. All the time, Mortenson was using donations from the non-profit to fund a never-ending book tour, complete with five star hotels and private planes. 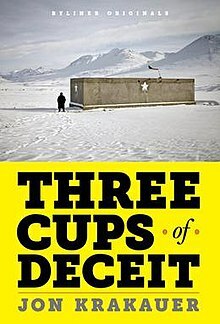 Three Cups of Deceit is my third book by Krakauer, and I have never been given a reason to doubt his journalistic integrity. I was surprised then, to see how closely he toes the line here. Krakauer is clearly angry, his words nearly simmer off the page with his fury at having been duped by Mortenson (Krakauer was a financial supporter of CAI). While his anger is certainly understandable, it is obvious that he was too close to this issue to maintain a professional demeanor. This is as much personal take-down as it is journalistic expose. You can find Three Cups of Deceit here on Amazon or here on Book Depository. The Audible version is excellently narrated by Mark Bramhall and is available here.